Here’s a summary of my Ryan family. It’s here so if you’re searching the web for my ancestors we can get in contact. Michael Ryan was born in Ireland and brought to England as a boy in the 1840s [but this story doesn’t match his birth date from the census] when the great potato famine was on in Ireland. The family settled in the area around Gravel Lane, Blackfriars. After he married, at different times he ran a fish shop, a greengrocers, and a laundry—everything was washed by hand, in big tubs in a washhouse at the back of the house, and then ironed with old flat irons which were heated on a stove. There was always a smell of wet washing everywhere. Note that living people are not shown for privacy reasons. 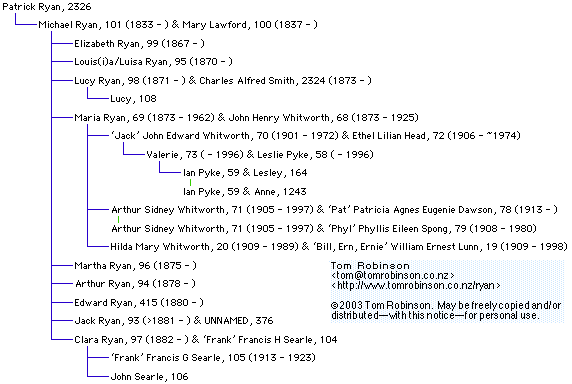 This ‘index’ lists everyone appearing above, plus their parents and living descendants (it omits any living people who have asked to be excluded). Any obscure branches off the tree appear on the main page.